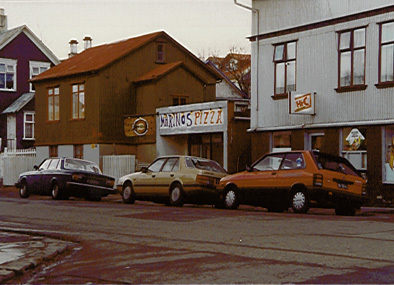 This is a picture of an Icelandic Pizza parlor in the old section of Reykavik. Oh yes Iceland is noted for its outstanding seafood but you can't get completely away from american culture. Iceland does have Pizza Hut as well. Just what you want to do huh?! Travel a few thousand miles for a deep pan sausage and extra cheese pizza. Well Pizza Hut in Iceland costs about $30.00 for 2 people. Needless to say I didn't eat alot of Pizza.